Curious about the history of soap making? 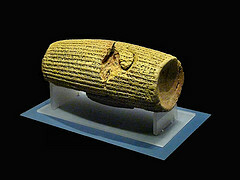 The earliest recorded evidence of soap-like materials traces back to approximately 2800 BC, found in clay cylinders during the excavation of ancient Babylon. Approximately 2200 BC, soap formula inscriptions were written on clay. Inscriptions mentioned fats were boiled with ashes, (which are a way of making soap), but there was no reference to the purpose. Approximately 1500 BC, ancient Egyptians used animal and vegetable oils, combined with alkaline salts, to create a soap-like substance. This substance was used for washing and treating skin diseases. Around 600 BC the Phoenicians used soap for cleaning wool, cotton and textiles instead of for human washing. The early Greeks did not use soap. They washed themselves with blocks of clay, pumice, sand and ashes. Next, they scraped sweat and dirt off using a curved bladed metal instrument called a strigil. Afterwards, they anointed themselves with oil. Much later, in the second century AD, the famous Greek physician Galen recommended washing with soap as a preventative measure for certain diseases, especially diseases of the skin. Bathing became popular in the Roman times. An entire soap factory was discovered in the ruins of Pompeii in 79 AD. The Romans exfoliated using abrasive substances like sand and pumice then scraped off the grime and dirt with sticks or a strigil. Luxurious scented baths and massages followed exfoliation rituals, with perfumed oils. By the 13th century the soap industry was introduced from Italy into France. Most soap was produced from the tallow of goats, with beech ash furnishing the alkali. Moving forward in the history of soap making, Great Grandma rendered animal fats to get oils, so she was limited to tallow or lard. We have all kinds of terrific oils to choose from, but lard with olive and coconut oil makes wonderful, basic, castile-type soap. Great Grandma had to make her own lye. We have standardized lye available, commercially. Today there is much research and science to be studied in the process of making soap. It's important to know the chemical qualities of different oils, the active properties of botanicals, the results of saponification and the physical properties of lather and bubbles. Making a mild and gentle homemade soap should be the goal. You wouldn't want a soap made of harsh, manufactured, chemicals. Soaps like that are plentiful on the market, today! A gentle cleansing soap with, natural, ingredients would be healthier for skin. Making soap may be tricky. Learn how to make soap from an expert. Follow proven soap recipes. Save time, money and energy! Find soap making supplies and learn how to use them properly. Carry on the tradition of making soap. Be creative! If at first you don't succeed, don't quit! Learn from mistakes along the way. Experience is a great teacher! Like the saying goes, "If at first you don't succeed, try....try again." Before long, you'll be a soap making expert too!